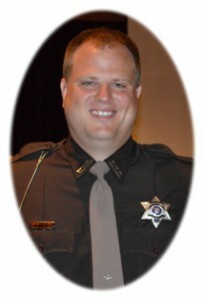 Ozaukee County Deputy Sheriff Adam Hartwig passed away unexpectedly at his home Friday, March 18, 2016 of natural causes. Adam was 30-years-old. He was born November 1, 1985 in Port Washington, Wisconsin to Dave and Lois Winnemuller Hartwig. The youngest of three boys he developed a sense of humor early and was the family cut-up, easily sharing a smile and a laugh. He graduated from Port Washington High School in 2004 and later received a degree in Criminal Justice from the University of Wisconsin-Milwaukee in 2010. Adam married the love of his life, Janel on a gorgeous winter day in 2012. They met in high school when he was 15 years old and soon they became high school sweethearts. Their real adventure began when Waylen arrived in July of 2015. Adam had a special bond with Waylen that no one will ever be able to replace. Waylen is a true reminder of Adam’s spunky personality. On August 26, 2013 Adam landed his dream job. He began working with the Ozaukee County Sheriff’s Office, starting in the jail and was quickly promoted to patrol. He was a kind-hearted and a dedicated law enforcement officer who truly considered his fellow Deputies his second family. Adam was very caring and willing to help anyone he could. He was always working on something around the house or helping a friend and always put others first. He had a lot of love to give and gave so much to his family and friends. He is survived by his wife Janel and son Waylen; his parents Dave (Lois) Hartwig of Port Washington; his brothers Jason (Jill) Hartwig of Appleton, Wisconsin and Brian (Andrea) Hartwig of Cedarburg and his nieces and nephews Jackson, Adelynn, Mabel and one on the way. Further survived by his in-laws Mark (Brenda) Slicker of the town of Port Washington and Mike (Dawn) Ninneman; sister-in-law Sarah (Chris) Slicker of Greendale, Wisconsin; his brothers and sisters in his law enforcement family at Ozaukee County Sheriff’s Office, aunts, uncles, cousins, other relatives and many friends. He is preceded in death by his grandparents Jerome and Arline Hartwig and Fran and Bernice Winnemuller. The Rev. Patrick Wendt will officiate a prayer service 7 pm Tuesday, March 29, 2016 at St. Peter of Alcantara Catholic Church, 1802 N. Wisconsin Street, Port Washington. Visitation from 4 pm to 7 pm Tuesday, March 29, 2016 AT CHURCH. The celebration of Adam’s life will continue after the service at Schooner’s Pub in downtown Port Washington. Memorials to the family for his son Waylen are appreciated. Previous Post: Evenson, Kenneth B. Next Post: Rosenthal, Jeffrey L.
Dave, Lois & Family, I am so terribly sorry for your loss. Cherish the memories of your son to carry on to share with Waylen. Many prayers to you all. Rest in Peace. Taken way too soon. Your family is in our thoughts and prayers. I am so sorry! May you and your family have the strength to move forward and cherish the memories! Prayers to you all! Very sorry for your loss. Adam and your family will be in our thoughts and prayers. So very sorry to hear this tragic news. To the entire hartwig family,, words cannot express how sorry we are to here of Adams passing. Such a shock. Please know you all are in our thoughts and prayers. May God give you strength through this most difficult time in your lives..
Dobber and I are so saddened by the loss of Adam. We enjoyed watching all of your boys growing up and laughed many times about Adams comedic personality. Please know you are all in our thoughts and are praying you find peace and strength in the days ahead. Our sympathies to Janel, Waylen, Lois, Dave, and the entire family. You are all in our thoughts and prayers during this difficult time. Lois and Dave, I am so shocked and sorry to hear of the loss of your son. He sounds like such a nice, sweet young man. Your description of his love and dedication for his family shines through like a beacon of light. Rest assured that he will always be with you and you will certainly see him in his son. I will send you and Adam good energy to help you all move through this hard time and into the next steps of your journey. Words can’t express how sorry I am for your loss. My thoughts and prayers are with you and your family. Lois, Dave and the entire Hartwig Family. My sincere condolences on the loss of Adam. I cannot fathom what you are going through….He will always be in your hearts and minds. The memories of him will help to get you through this. Your family are in my prayers. God Bless your family. I know looking a child, son, brother, or husband isn’t easy. May Adam rest in peace. My prayers & thoughts are with you. Your love for your 3 boys is reflected in their lives. May God keep you all strong & bring you peace during these difficult days. I pray you will walk with Adam again in life everlasting with our Savior, Jesus. We were so sorry. You are in our thoughts and prayers. Katy Johnson, Derek and Trevor. My deepest sympathies go to the family of this fine young man who will be so missed by all who knew him. Lois and Dave, I am so sorry for your loss. It is always said, we should not have to bury our children. I can not imagine what you are going thru. Remember, God never gives us more than we can handle, but a time like this is when He is really testing you. All of you are in my prayers. God Bless. So sorry for your loss. Janel was in my daughter’s Brownie troop as a little girl but I remember her well and my prayers go out to her and her son and the extended families. This is so very sad. To the entire Hartwig Family — we are so very sorry for your loss. Please find comfort in knowing God has a bigger plan for Adam. My thoughts and prayers are with you in this difficult time. Much love! To my cousin, Lois, and her family, my heartfelt condolences on the loss of your son, Adam. Your baby is always your baby, regardless of age and it is so difficult to lose a child. To Adam’s wife and son, my hope is that you find comfort in knowing that you were the light in Adam’s life. May your memories of your husband and father bring you peace, and carry you through life. Our hearts & thoughts go out to you. So sorry to hear about Adam. My heart is broken for your loss. My thoughts and prayers are with all of you. So sorry for your loss. May God bless.